The small-time American producer Max Rosenberg, and the avid fantasy fan and film-maker Milton Subotsky teamed up in the 1950s to produce some rock and roll pictures, but inbetween they scriped a Frankenstein movie that was eventually sold to Hammer to become their debut horror picture Curse of Frankenstein (1957). That film's success, for which the American duo found themselves uncredited, inspired them to make their own horror picture in Britain under the Vulcan Pictures name - its success would eventually lead them to form Amicus films. Co-scripted by writer George Baxt and the producer Milton Subotsky, City of the Living Dead does not have the most original storyline, and the notion of remote and lost villages still haunted by the events of their pasts, should be familiar to any fans of classic horror literature. Fortunately the story is well written enough that it retains interesting, and has some rather surprising twists - the notion that the witches are still alive, that should be quickly obvious to most viewers pretty quickly, is confirmed half way through and not kept as a big "surprise" for the ending. The film is noticably short, running to only 80 minutes, which means that there is no need for padding and the pacing is good throughout - the build up and the climax is very effective, although as happens quite often in the genre, it does seem a little contrived. More important than the storyline however, is the amazing look of the film. The sequences in the town of Whtiewood were all shot on soundstages, allowing extensive use of smoke machines and controlled lighting, while completely over-the-top and unrealistic, it gives these scenes an amazingly unreal and nightmarish quality that has rarely been bettered by even the best horror directors (it is heavily reminiscent of the ambience achieved by Mario Bava in his horror debut, Black Sunday). While the black and white film stock was used here due to simple cost considerations, it is hard to imagine that the film could have been half as effective if shot in colour. Composer Douglas Gamley, who would go on to compose many of the later Amicus films, certainly realises the creepy nature of plain-chant and uses it very effectively (over a decade before Jerry Goldsmith scored The Omen (1976)), while some light jazz from the era fills out the other scenes. Although not top billed, Christopher Lee is certainly the biggest name in the film - sporting a surprisingly good American accent, he gets one of his first 'straight' roles in a horror film (having spent his first trio in Hammer sporting heavy make-up) and gives a very strong performance. Betta St. John might be recognised by fans, having appeared in the similarly atmospheric British horror film Corridors of Blood (1958) as well as two Gordon Scott Tarzan films and biblical epic The Robe (1953) - she plays the last role before her early retirement, and gives a solid performance. The rest of the cast are solid, and look (or listen) out for the beautifully toned British radio and film star Valentine Dyall who plays Jethrow. 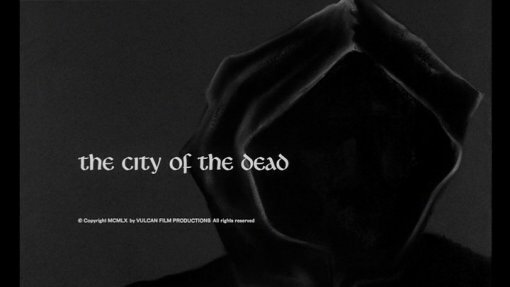 An superbly creepy horror film with a good storyline and acting, and some amazing direction, City of the Dead proved to Rosenberg and Subotsky that there was money in horror films, but despite all their efforts down a decade of production, they were only once able to match the genuinely creepy and unsetting atmosphere of this film (cf. And Now the Screaming Starts (1973)). It comes recommended to all horror fans, and highly recommended to fans of classic and British horror films. Anyone famous in it? Christopher Lee - one of the best known horror actors, including an appearance in The Devil Rides Out (1968). Directed by anyone interesting? John Llewellyn Moxey - a little known British director who helmed a few horror pictures, including the Dan Curtis television film The Night Stalker (1972) and Christopher Lee and Klaus Kinski in Circus of Fear (1966). Highly recommended to all British and Classic horror fans. Good soundtrack? Douglas Gamley provides some very impressive and creepy plain-chant, and a light jazz score. The film looks great, with almost no grain or print damage and a very clear picture. Audio English language original mono, sounds fine throughout. Audio commentary with Christopher Lee and moderator Jay Slater, some interesting stories, although they spend a lot of time just discussing (and getting confused about) what is going on in the film, and there are many questions left unasked. Audio commentary with director John Llewellyn Moxey, some interesting discussion, but some gaps and silence as well. Interviews with directors John Llewellyn Moxey (25 minutes) and actress Venetia Stevenson (19 minutes), discussing both this film and their careers in general. Photo and poster gallery, presented as a video file with soundtrack backing. Not manually scrollable. Talent bios of the director and main cast, presented as video files. Other regions? A variety of public domain releases in the USA, and a cheap release in the UK, mostly extra free and with poor prints (mostly the altered 'Horror Hotel' cut of the film). Comparison between the VCI R1 disc (left) and the UK GMVS disc (right). Cuts? The film is believed to be completely uncut as per the original British theatrical release. For American distribution, the film was cut of two minutes (with the intention of adding extra special effects shots in 3-D which never happened) and entited Horror Hotel. A very impressive and creepy horror film with some beautiful atmosphere. Highly recommended. VCI do a superb job with this public domain film, providing a strong print and a solid mix of extras. The only DVD of this film worth getting. Highly recommended. All text in this review written by Timothy Young - 18th September 2007. Part of Horror September 2.